I am kind of making a big deal out of Jaxson's first birthday. 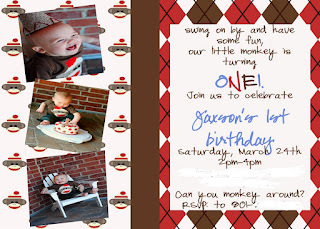 For a few reasons.... first of which is that I wasn't at Cayden's first birthday nor was I at Ally's first birthday. I am fine with both now. HOWEVER I still have moments where I wish more than anything I could have been with Cayden on such a special day. So me making a big deal about Jaxson's first birthday is a way for me to deal with things that I don't have control over in the past. Second reason is because Jaxson being part of our family is a miracle! After 3 miscarriages I felt like I was NEVER going to have another baby. I was heart broken and sad a lot of the time. I was starting to cope with the fact that maybe biological children weren't in my near future. That was when I found out I was pregnant with Jaxson. I had a VERY rough pregnancy and was lucky to get him here safe. I can't thank my Heavenly Father enough for giving me this perfect little boy to raise. We are SO blessed to have his spirit in our home. So I'm going all out... and you know what... I'm happy to do it!